Hasbro Moving Into 3D Printing, Trademarks "ALLSPARK"
Could custom Transformers and Dungeons & Dragons miniatures be on the way? Hasbro has filed a trademark application for "ALLSPARK", listing a number of 3D printing applications in the filing. The trademark application, filed May 9, is the first indication of what the Hasbro is developing in its partnership with 3D Systems. In February, Hasbro announced a co-venture with 3D Systems to develop and commercialize 3D printers for play. The announcement states that all of Hasbro's brands are a part of the venture, which includes Transformers and My Little Pony, as well as the Wizards of the Coast properties Magic: The Gathering and Dungeons & Dragons. Computer software for creating, designing, modifying, customizing, sharing and saving computer generated representations capable of being printed by a three dimensional printer to create physical objects, namely, jewelry, ornaments, arts objects, artifacts, household goods, toys, games, hobby models, accessories, office products, and various other consumer products. Custom prototype fabrication via three dimensional printing for others of new parts, components and models for others, namely, jewelry, ornaments, arts objects, artifacts, household goods, toys, games, hobby models, accessories, office products, and various other consumer products. Providing a website featuring technology that enables users to download, modify, and share three-dimensional designs on the Internet for use with computer driven machines for making three-dimensional embodiments of the designs; providing online computer games and interactive multiplayer online games via global networks. Based on those descriptions, the ALLSPARK trademark will be used for a variety of 3D printing applications. 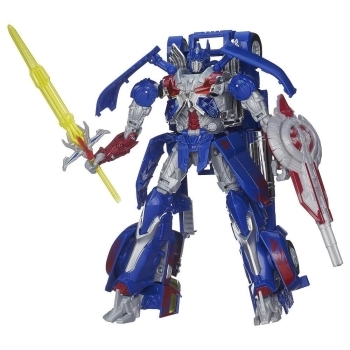 The name, ALLSPARK, suggests that Transformers toys may be the first to get the 3D printing treatment from Hasbro. In the Transformers universe, each Transformer possesses a Spark, its "soul", which came from and returns to the AllSpark after death. In January, Hasbro announced that Transformers toys will be simpler in future, a change that may also make 3D printing of Transformers toys easier. For tabletop roleplaying games, the possibilities for printing miniatures could be endless. With a library of components, weapons, and body types, character creation in Dungeons & Dragons could soon include printing a custom miniature of your sling-wielding, flower-wreathed Dwarf druid. Similar projects, such as Mech Maker, a Kickstarter project to print custom mechs for tabletop wargaming, have struggled to collect enough funding, but demonstrate how such a system might work.